New book, 88 pages, SS10237. With a top speed of Mach 2.2 and the ability to carry more than 18,000 pounds of weapons on nine external hardpoints, the tandem-seat McDonnell Douglas F-4 Phantom II was a large fighter-bomber that served as a major component of U.S. military air power from its introduction in 1960 to its retirement from U.S. combat squadrons in 1995. Like other interceptors of its era, the Phantom was initially designed without an internal cannon, being armed with air-to-air missiles, air-to-ground missiles, and bombs of various types. Later Phantoms were fitted with the M61 Vulcan rotary cannon. Technological innovations featured on the F-4 were the use of an advanced pulse-Doppler radar and extensive use of titanium in its airframe. The F-4 saw major action during the Vietnam War in the 1960s and 1970s serving as the principal air superiority fighter for both the Navy and Air Force. Later in the conflict it took on important ground attack and aerial reconnaissance tasks as well. The Phantom was still in service during the Gulf War of 1990-1991 where it performed reconnaissance and suppressed enemy air defenses. Produced from 1958 to 1981 the Phantom also served in the armed forces of 11 other countries. At the hands of the Israelis it saw considerable action in Arab-Israeli wars and it was employed by the Iranians during their war against Iraq in the 1980s. 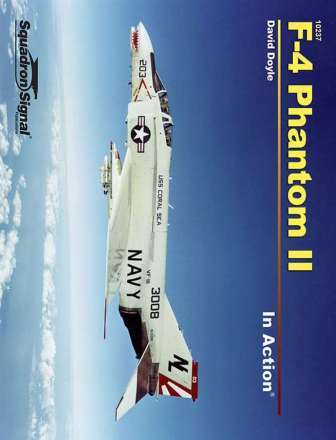 This 88-page volume, which is packed with 211 photographs, covers the design and development of the Phantom, beginning in response to the need for a carrier-based Navy interceptor in the mid-1950s, and tracing innovations and changes introduced to the aircraft during its long career. This item was added to our catalog on Monday 07 September, 2015.